Here’s one of our unique 8th grade worksheets, that even adults will find to be very challenging. How long will it take you to solve it? Here's a peek at the printable page. Full instructions and clues also appear below. 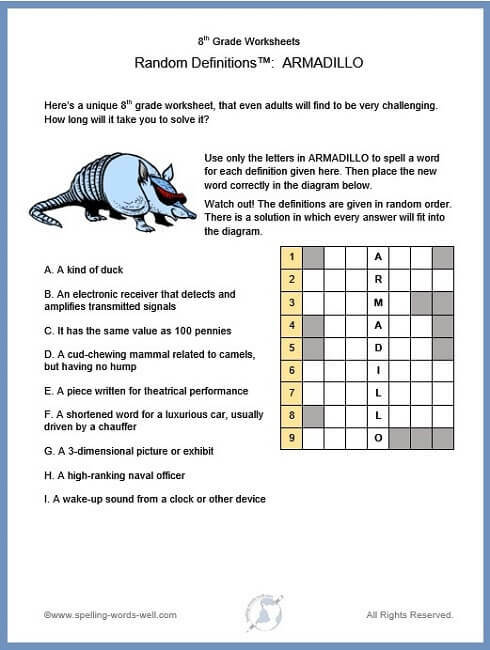 Instructions: Use only the letters in ARMADILLO to spell a word for each definition given here. Then place the new word correctly in the diagram. Watch out! The definitions are given in random order. There is a solution in which every answer will fit into the diagram. See the printable version and answers. Figure out answers to these clues, then place your words in the diagram on this printable page. Note: While you may be able to place some of your answers in more than one line in the diagram, you need to find a solution in which all the words fit. You may also enjoy this ARTICHOKE puzzle which uses the same format. On this printable worksheet, you'll see that each set of scrambled words contains 8 lines. One of the words describes the topic. The other seven words can be unscrambled to spell words related to that topic. Make sure you can solve it before you share it with your students! Cryptogram Worksheet: Another great 7th or 8th grade worksheet. This one includes instructions so students, parents or teachers can make more cryptogram puzzles with any word list. "Ex" Marks the Spot - Another great vocab worksheet upper grades. In this fun crossword puzzle, every answer begins with the letters EX.